Cross-comparison test of the most popular node.js argument parser libraries in 2018. 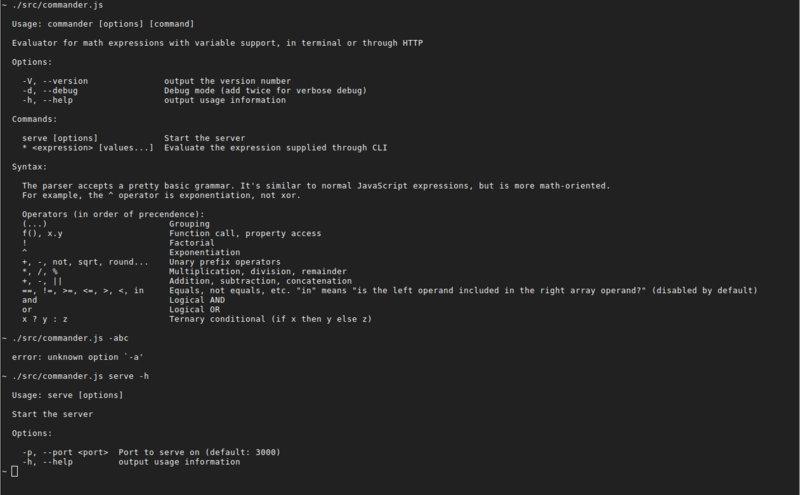 I have tested commander, yargs, caporal, optionator, sywac, sade, command-line-args and argparse. Honorary mentions for minimist, nopt, gar, mri, arg and meow. As node.js code base at the day job got more mature, I was in the market for a new command line parser library. In the past, I have used argparse, yargs and a few others. But a fresh project is always a chance to reexemine past decisions and get my tooling up to speed with current landscape. In some node.js problem spaces, there is a clear winner; one library that is the default golden path for most developers, in most use cases, and stays that way for a long time. For example, express.js for web servers or moment.js for date/time manipulation. That doesn't seem to be the case for command line parsers. Over time, different contenders came into prominence and then faded away. It's less clear which one is currently "the best" (if there can even be such a thing), or at least the accepted standard. So I decided to do a little cross-comparison test. To test different argument parsers, we need a program they will parse the arguments for. I have opted for a simple math expression evaluator. You call it with an expression (eg. (2 + x) / 3), it solves it (for given value of x) and spits out the result to a console or serves it on the web, depending on arguments. Here is the interface I'd like to support. Show help screen. All flags and commands must be shown here. 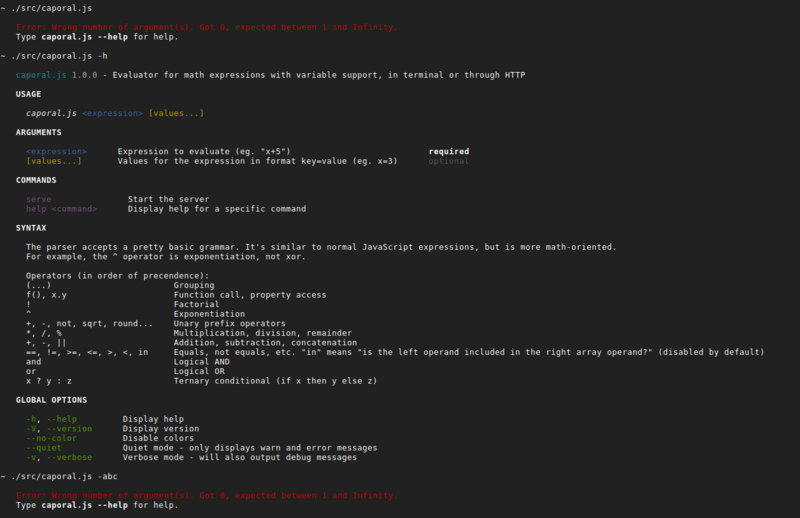 The expression evaluator has its own syntax, which I want displayed here as well, in some kind of a "footer" section. First positional argument is an expression to be executed. All subsequent positional arguments are values for the expression, in format name=value. In this mode, expression is immediately executed and the result written to STDOUT. In case some of the variables are not bound, program enters an "interactive mode", where missing values are fed through STDIN. The equivalent of the above command. Basically, the eval command should be the default command, to be executed unless some other command is present. Start expression evaluator web server, listening on port 12345. Note that -p argument only makes sense here. It shouldn't be applicable to the CLI use case. Port has a default value (3000), that should be honored in the parsing and on the help screen. Start the app in verbose debug mode or super-verbose mode (each d increases verbosity). This switch should apply globally, for either web server or CLI use case. For each parser, I will write an app implementing the interface above or a close approximation of it (I will allow deviations from the API, as long as the full functionality is covered). How much functionality is in it? How well can it execute my requirements? Can it output help text and errors correctly? How well is output formatted? Does it have a good API? How much boilerplate is needed? What is the documentation like? Can I get some intellisense going? What is the general feel of the library? Is it popular? Maintained? // Will also handle reading from STDIN, in case some values are missing. For each of the candidate libraries, I have written a program implementing the requirements above to the best of my abilities. As we are about to see, very few were able to fulfill them exactly right, but that's OK. The requirements are intentionally a bit tricky and vague, intended to take libraries off the beaten path. I have also tallied the rough number of Github stars and forks, NPM downloads, dependencies (how many other libraries do they require in package.json) and licences you'll have to worry about. This info is reasonably accurate as of 2018, but do not expect it to be updated. It's for informational purposes only. With that said, let's get going. Commander has the strongest github presence out of all tested libraries. It's one of "the big two" (besides yargs). It's inspired by Ruby's commander library. The basic interface is pretty straightforward. You attach global options directly to the imported module. Then call .command() for each command, and attach additional options to the returned command instance (it has a fluid API). After parsing, common options will be attached on the program object, while command specific switches will go to the cmd argument to the command function. This was a bit confusing at first, but I got used to it. It supports commands and default commands, it can generate help with description text and version number and collect multiple arguments using reduce-like syntax (very neat). Good typings support out of the box and no dependencies, both increasingly important features for me. The library's age shows. I get a strong odor of a legacy project, where more and more features have been added over the years, distorting the original API surface of the project. 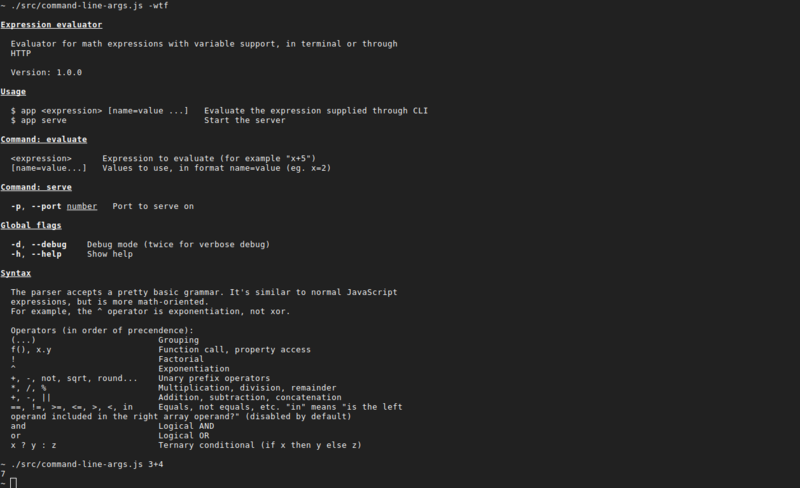 For example, if you do program.command('cmd', 'My command'), commander will try to find and execute file app-cmd.js. The way this differs from "normal" commands is the existence of the description (the second argument). But why can't I describe normal commands? Why isn't this a completely different method? Very strange and non-intuitive API, in my opinion. The way you specify long and short parameter names is kind of clumsy. You can't have a short option without a corresponding long version. I had issues implementing the default subcommand. The way this is supposed to work is through isDefault option. However, I could only get it to work with git-style commands (where name of the command is directly mapped to an executable on HDD). It doesn't work with action style callbacks. 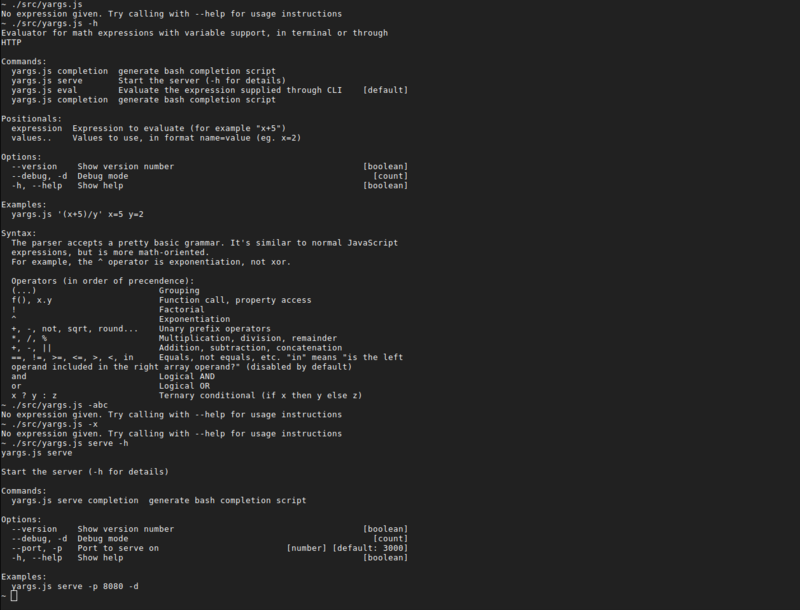 I ended up "solving" that by naming my CLI command "*", but that produces a rather ugly help screen (see above). Varargs are not marked in the help text. Need to be done manually. There is no way to tell which command has been executed, if any. Commander is not outstanding in any particular metric, but is at least solid in all of them. A decent all-around choice. This pirate-themed library is the second most popular argument parser on the list. I find the overall presentation a bit goofy, but that doesn't stop yarrgs from being very powerful. You specify options using a fluid api. You are encouraged to make the entire yargs usage a one statement. It supports all needed options to make the API that strongly matches my specification. The library seems to have recently gone through a serious transition, where it has moved from a fully fluid to a more object-based configuration notation. Unfortunately, the old api and docs remain around, which makes figuring out how to do things harder than it needs to be (in 2018). In my program, I have decided to use object-notation to define all the arguments and their switches. In general, I found the documentation rather lacking. Example: Variadic positional arguments are only mentioned briefly in the advanced usage guide, and are missing from the central API docs. The library does have a lot of features, so inconsistencies like this are somewhat understandable, I guess. Code completion is awful out of the box, but there is a @typings library available that makes it better. Help text clearly shows default value and type for each switch. This is surprisingly rare for argument parsing libraries. There is no way to add text preamble, with program description. I used the "usage" field for that. Help for commands is not displayed directly on the screen. User has to do "program command -h" in order to get help. That is not clearly indicated anywhere on the help screen. I ended up adding a little pointer manually. I couldn't get it to display full help in case command was called without an expression. I had to add a hacky console.log message for that case. This is one of rare libraries that also generates a bash completion. I had to manually add my app to ENV, but after that, I got it working just fine. Yargs is one of the most powerful and popular libraries around. On the downside, I personally found it somewhat unpleasant to use due to combination of confusing docs and overly large api surface. A full-featured framework for building command line applications (cli) with node.js, including help generation, colored output, verbosity control, custom logger, coercion and casting, typos suggestions, and auto-complete for bash/zsh/fish. 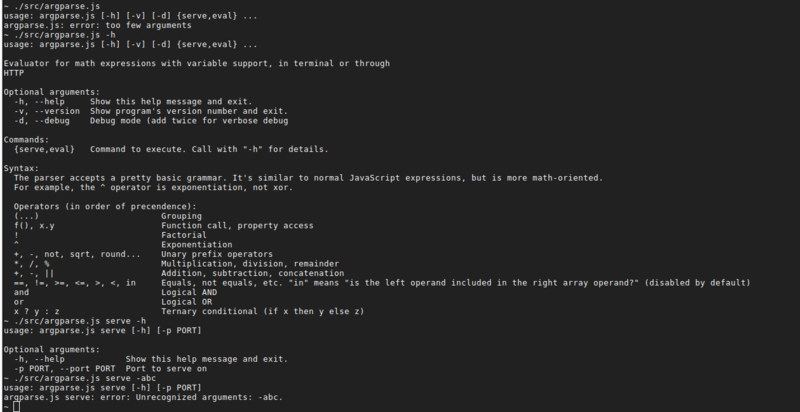 Why would you need a framework for parsing command line arguments? Let's find out. Caporal is indeed a framework. It wants all your code to live inside its action() callbacks that are triggered based on CLI commands. They automatically parse logger verbosity options, create a winston logger and feed it to your command methods. This is all extremely opinionated - their way or the highway. In general I like how help is formatted (colors always help). There is no way to write anything beneath the global command line switches in options. Also, there is no way to get a hook into the help system through an event or similar mechanism. AND you can't disable auto-help and display the help manually. I ended up just adding a "SYNTAX" section that is printed out right above the global options. I am not thrilled how it looks. Since they auto-parse verbosity, I've decided to use their API surface, with --verbose,-v and --silent switches, instead of my intended -dd api. It doesn't support flag aggregation. For example, I couldn't even do "-dd", only "-d -d" which is lame. Documentation is poor. I had to dig through their source code multiple times. When you call the program without arguments, you get a super goofy error message: Error: Wrong number of argument(s). Got 0, expected between 1 and Infinity.. There doesn't seem to be a way to customize it. Caporal claims to have bash completion, but I couldn't get it to work. Caporal "framework" alows you to put together pretty nice CLI app without a lot of effort. If you want something super quick or exactly agree with their decisions, it's an OK choice. It's not for me, though. Small amount of stars and a huge number of downloads indicate an internal-ish library used by a small "cabal" of popular libraries (as indicated by disparity of npm downloads and stars). It hasn't been updated since 2016, but that's not necessarily a deal killer. Sometimes, software is just "complete". The problem with other option parsers, such as yargs or minimist, is they just accept all input, valid or not. With Optionator, if you mistype an option, it will give you an error (with a suggestion for what you meant). If you give the wrong type of argument for an option, it will give you an error rather than supplying the wrong input to your application. `$ cmd --halp Invalid option '--halp' - perhaps you meant '--help'? $ cmd --count str Invalid value for option 'count' - expected type Int, received value: str. Interesting, but I am not sure I want my arg parser library to do all that. Unlike the libraries we've seen so far, this one uses a more conservative, declarative API. Big minus out of the gate: optionator doesn't support commands. I ended up triggering my server using the --serve switch. Unfortunately, that means there is no separation of the port argument from the eval command. It doesn't support counting of joined flags. I had to use --dd instead of -dd. I had to add a lot of custom help text to prepend and append to make help text look decent (but not great). It will indeed try to correct mistyled switches, but I personally find it more useful to direct users towards the --help flag. The library has a lot of fiddly options, but they feel like they've been added to fill some specific use case the author had, and are not overly useful in a general sense. Optionator is a minor library with "the one thing" to try and raise it above the crowd (validation stuff). Unfortunately, I don't find its "one thing" particularly useful, at least for the way I do things. The authors really went all out with this library - they bought a domain and made a logo and set up an actual site. Unfortunately, their marketing push has failed, judging by the number of stars and downloads. Of course, none of that reflects in any negative way on the library itself, I'm just saying. Sywac's api is heavily inspired by yargs. I found it perfectly reasonable and clear to work with. Sywac has a concept of "default command", but neither it nor its parameters are displayed anywhere on the help screen. User would have no idea it even exists. This feature frankly seems broken. I ended up just adding an eval command, and not supporting "default" at all. The library doesn't have typings or JSDoc annotations. Intellisense in WebStorm was pretty poor. Documentation is set up with high ambitions, but as it stands now, it's only half-completed. Once again, I had to dig through source code to figure out how some features work. There is no aggregation type. I had to declare -d as array type, which kind of works but generates an ugly help text. It supports varargs as the last argument, but for some reason it returns [undefined] in case none are given. My code had to make up for it. It has solid help output, with defaults and types. There are a lot of other options there. For example, it offers hooks to colorize each element of the help screen (which I didn't end up using). Due to incomplete state of documentation, I suspect there are at least some nuances I am missing here. Sywac is a nice and ambitious attempt, but due to bugs, incomplete documentation and low bus factor, I can't recommend it at this point. It enables default commands, git-like subcommands, option flags with aliases, default option values with type-casting, required-vs-optional argument handling, command validation, and automated help text generation! Your app's UX will be as smooth as butter... just like Sade's voice. This reference will not get old or annoying at all. The api is similar to commander. The library has a default command option (you can do app 2+2, immediately executing the eval command). This is not clearly marked in the generated help, though. It doesn't support variadic arguments directly, but I found a way to hack it in manually by consuming unparsed arguments. It doesn't support counting flags, but it will group up to two flags into an array like [true true] (but only two; any further flags are ignored). This is not indicated in the rather barebones single-page documentation page. There doesn't seem to be a way to insert own texts (like software description or syntax info) into the help sections. Sade is a decent library, but it doesn't offer enough to recommend it over its more popular counterparts (other than cutsey culture references). This library doesn't have native help output, but comes with a companion library that handles that part: command-line-usage. I will treat them as one library. The API style is configuration based, and very hands-on. Out of all the tested libraries, this one feels the most like a library. It doesn't try to do anything overly "magical", and expect you to pitch in in order to make advanced functionality possible. 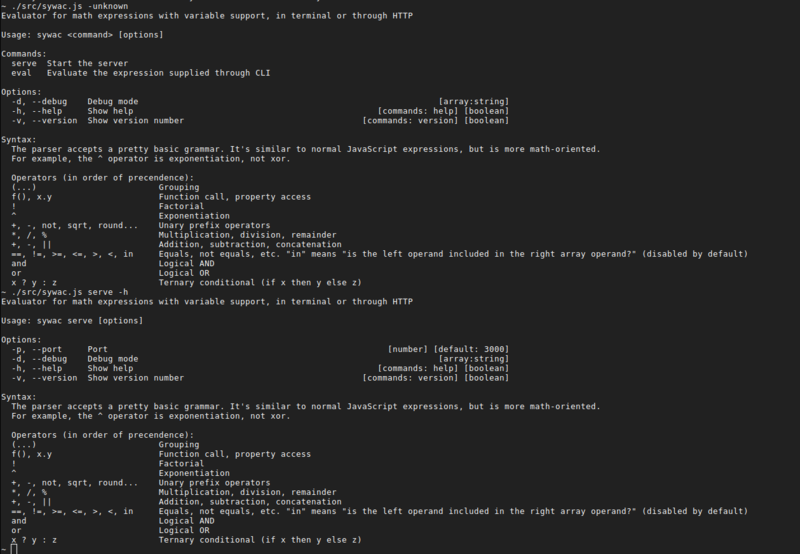 For example, wile CLA does support commands, it will not do any nested argument processing on its own. In my implementation, I use the partial switch to stop parsing after command is detected, then parse again with the command-specific options. Much more code is needed than doing similar thing in other arg parsers, but there is more flexibility too. Very nice help screen. I appreciate the suport for adding custom help sections. I only wish they'd allow adding multiple sections under one header (eg. an intro text, a table, a final remark). Documentation is pretty good, they have both example usage code and API listings. In my implementation, I was a bit lazy and added help for all subcommands on the main help screen. There is nothing stopping me from separating it into command-specific help screens, if I wanted it to work that way. There is no support for positional arguments. I had to implement my own on top of the library, using its primitives. No attention was put into user feedback. The library throws ugly errors and, once again, it's up to my code to catch them and make something user-friendly out of them. Library supports adding ASCII banners to output, which is super cool. Unfortunately, I found alignment a bit buggy when I tried using backslash characters anywhere inside the ASCII art. command-line-args gives you a basic toolbox to parse args and show nice help output, but requires you to pull your sleeves to get something more advanced going. Recommend for advanced programmers that have the time to fiddle a bit and make things work exactly how they like. An older library, port of python's argparse module. In my previous experience with this library, I remember it being powerful, but difficult to use due to poor API and documentation. Let's see if anything has changed (spoiler alert: nope). As I remembered, argparse is a very full-featured library, with support for commands, flag counting, type casting and aggregation. There is a lot of NPM usage, but not that much github action, indicating a library that is used internally by more popular libraries but not so much by a wider community directly. There is a typings library that adds some code completition help. Unfortunately, some options are only given as magic strings, that you have to hunt on their bad documentation page (more on that below). In general, argparse has the most fiddly and unfun to use API of all the parser libraries I have tried. Option names are unintuitive and unmemorable. You have to call many methods in a procedural fashion, without a fluid interface. I remember making a declarative configuration layer around it the last time I used it in production. As mentioned, documentation is pretty bad and incomplete. Only the basics are covered in the library's README file. For the rest, you are directed to the python version's docs, which while complete, require you to mentally translate between python and nodejs conventions. Help output is mediocre. It doesn't show the defaults, or any other metadata it has about flags. It shows subcommands as a single one-liner, without additional details for each command. Global arguments must be given before commands. For example, I can call app -dd serve, but not app serve -dd. Makes sense technically, but I'd stil like more flexibility there. Argparse has an "eplilogue" option, but I couldn't get it to work for my use case. It was obviously meant for simpler one-line texts. It hopelessly choked on and mangled my multi-line syntax help. I ended up shimming their help formatter function to add my own custom epilogue. As a sidenote, the internals of the library and pretty clean and well documented, making it relatively easy to hack around. Argparse is a powerful and stable library, but with mediocre docs and help output. There are better libraries around with similar features. I will now briefly mention some libraries that I've rejected based on reading the documentation and fiddling a bit, but without writing the actual test program. Same rules apply for star/fork/download numbers as above. Instead of giving it option definitions, you just call it against arguments and it then tries to guess what they mean and packages them into an object. So, no varargs, no help screens, no validation. I'd have to build all of that manually on top of it. I've decided that's too barebones for what I want out of an argument parser library. Therefore minimist is out. What's this? Relatively few github stars, but tons of npm downloads? Turns out, this is the lib that npm.js developed internally to handle parsing for their npm utility (that's why the download count). If you want to write an option parser, don't write an option parser. Write a package manager, or a source control system, or a service restarter, or an operating system. You probably won't end up with a good one of those, but if you don't give up, and you are relentless and diligent enough in your procrastination, you may just end up with a very nice option parser. Unfortunately, even though it has predefined argument definitions, it doesn't seem to have a help layer at all. A weird in-house-ish project that never caught on, doesn't get updated often and should probably be avoided. "Like minimist and optimist, only even smaller (4kb)". It gets disqualified for the same reasons as mininist. This is a fast and lightweight alternative to minimist and yargs-parser. Another minimal library, that is better used as a basis for other libraries than directly by application developers. And in fact, it is the basis for the sade library, covered above. An npm prominent name squater, without a lot of features or adoption. Its NPM downloads have recently jumped through the roof (100 -> 100K), so it might see some more maintenance in the future. Ridiculously popular library. Unfortunately, it doesn't seem to support help output or commands, so it's out for my use case (2 strikes out). Even though it lacks in argument parsing abilities, it adds some framework-like capabilities - catches unhandled promise rejections, sets terminal title etc. I am not sure I like this combination of features, although it's arguably a better mix than Caporal, with their ridiculous logger integration. I am also concerned with the huge debt of dependencies and licences it brings in, but since I haven't tried it, I'll reserve my judgment. After all this, which library did I like the best? Well, as you might have guessed, I have chosen the combo of command-line-args and command-line-usage for my current project. I like the flexibility it gives me and how it formats output. I added the ASCII art company logo, built some tooling around it, and it's great. So, am I saying command-line-args is the best argument parser library around? Not even close. If fact, for most users, in most use cases, I would recommend you stick with yargs. It has huge community, excellent features, it gets updated regularly, and you can just grab one of the demos from the site and get going quickly (hopefully, they clear up confusing docs and API soon). Similar can be said for commander. Great adoption numbers and solid features put it above more technically capable but less popular libraries like argparse. Finally, if you happen to be building a very throwaway very unambitious CLI app, something like Caporal might get you up to speed faster than any of the more library-like libraries mentioned above. None of the other "underdogs" were quite good enough to earn my recommendation, but that's just one guy's opinion. I invite you to go through the screenshots and code samples, and form your own judgment. Maybe one of them turns out to be the perfect fit for your own project.